Hourigan’s has been providing Victoria, BC with flooring solutions and window coverings for the past 62 years. Their showroom is the biggest in Victoria, with a wide selection of carpet, hardwood, laminate, linoleum, vinyl and ceramic tiles and a large display of Hunter Douglas window blinds. Hourigan’s also has hundreds of carpet, linoleum and vinyl roll ends in stock. 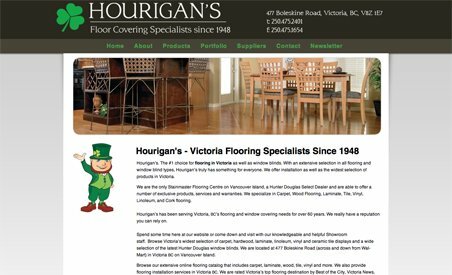 Hourigan’s has been providing Victoria, BC with flooring solutions and window coverings for the past 62 years. Their showroom is the biggest in Victoria, with a wide selection of carpet, hardwood, laminate, linoleum, vinyl and ceramic tiles and a large display of Hunter Douglas window blinds. Hourigan’s also has hundreds of carpet, linoleum and vinyl roll ends in stock. With their superb customer service and knowledgeable staff, it’s no surprise that Hourigan’s is regularly rated “Victoria’s Top Flooring Destination” by Victoria News’ Best of the City.